This Designer School Labels Value Kit is brilliant! Great variety of sizes to label just about anything, my kids love them and identify them easily! I couldn’t be happier with this purchase! Already came back to order more! Leo is definitely going to be too cool for school with his Skull & Crossbones Labels! Love love love! This Designer School Labels Value Kit has everything! The Shoe Labels have lasted inside the shoes all year and still going strong, they actually outlasted the shoes! The Clothing Labels are great quality and so easy to apply, The stick on Labels can even withstand the dishwasher! Excellent quality and value for money! These Family Planners are great quality and a fantastic way to help organise the family’s daily activities! They're bright, fun and easily stick to the fridge with the magnets supplied. You can stick the whole pad or peel off individual pages so it’s not too heavy. Great product! These Bright Star Kids Labels are incredible! I wash up in boiling hot water and these labels do not peel off. Bright Star Kids is recommended by me, my kids love them and I will definitely be buying them next year! I ordered these Round Shoe Labels to label shoes for daycare, they've been in the sandpit, puddles, dirt, bark and thoroughly road tested by an adventurous toddler and they've outlasted the shoes! I will definitely order again! I ordered these Medium Name Labels for my kid's lunch boxes, drink bottles etc. These labels are exactly as advertised, I love the bright colours! Arrived quicker than expected! A friend of mine told me about these Small Name Labels as I was looking for some for my daughter. Very fast delivery and an amazing quality product. Very happy mama here! Great quality, lots of storage room even though it is a Junior Backpack. Perfect for daycare to store change of clothes, bottles etc in different pockets for easy access. Very happy with this purchase! I love this Designer Daycare Labels Value Kit, the Labels are so cute and great for all of my daughter's daycare belongings! Great quality! The Designer Medium Name Labels are great! No matter how many times I wash the items, the labels still look the same as the first day. The colour does not fade and perfectly sticks to the surface. Great customer service! I recommend this product! Amazing labels and fast delivery!! These Medium Name Labels are the ideal size! I really love the colours available in the multicolour ranges. Very easy, quick ordering process, great communication and fast postage! Great quality, kids love them! This Designer Essential Labels Value Kit is perfect! Amazing quality and the labels don’t fade or peel off. Super cute designs and my kids absolutely love them! I love these Door Signs. Picture quality is clear and bright, perfect size for the kid's bedroom doors. I love that our boy's rooms are themed with everything from one place. They look amazing! We purchased these Transport Wall Stickers for our boy's room and they are perfect! Our little boy loves them on his wall, they are great quality and so easy to apply! There are also some great suggestions on how to arrange them. Delivered to our door within a week. I am delighted with the Placemats I bought for my grandchildren. I highly recommend Bright Star Kids products for wonderful personalised gifts! These labels last and last but still remove easily when needed with no residue! They get put through the dishwasher a good few times a week and are still on things from years ago. These are the only labels we use! I bought these Mini Name Labels in preparation for daycare. The quantity and size of the labels is perfect! They have lasted through washing, sterilising, back and forth to daycare and a teething baby! I’ve had plenty of people ask me about them because they liked them so much. The choices in designs, colours and fonts make for unique and fun labels. Thanks, Bright Star Kids! These Mini Clothing Labels are amazing, exactly as described! Ordered with ease and they arrived early. Will definitely be ordering more in future with Bright Star Kids! Bright Star Kids is famous for making the cutest and longest lasting name labels, perfect for giving as a gift or for labelling all your kids’ belongings. You can also find lots of other personalised gifts for girls and boys with our quality range of personalised school supplies, room decor and t-shirts. Established in 2005, Bright Star Kids has expanded it's range of top quality products that are personalised for your child. We're so sure you'll be 100% happy with your order, that we'll go above and beyond to ensure we help you with any issue you may encounter. Our most popular name labels are super durable so they can be used on all your baby or older child’s belongings, ideal for daycare or school. In fact, we have school labels and iron on labels that can be used on almost all of your child’s school belongings, such as shoes, clothing, pencils and lunch boxes. Our very popular school labels kit contains a huge range of name labels at an amazingly low price! To make back to school extra fun you can get matching school supplies in the same design theme, perfect if you like to co-ordinate your children's belongings. 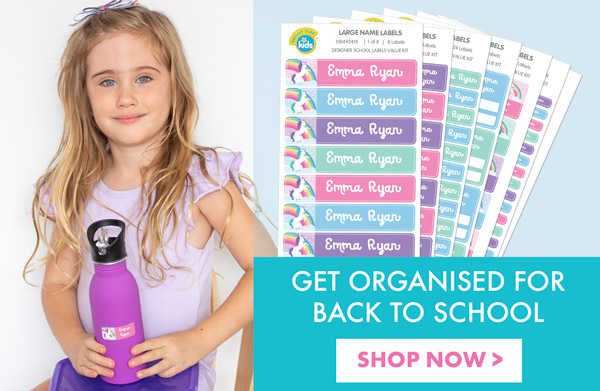 You can also get a huge range of personalised school and lunch bags, drink bottles, bag tags and name labels, ideal for kids going to preschool, kindy & big school! Our fantastic range of removable wall stickers are used to transform dull rooms into fun and playful bedrooms - perfect for girls and boys alike. You can get a lot of inspiration by browsing through our wall stickers and wall decals range. We’re sure you’ll find it hard to pick only one of our gorgeous wall stickers for your child. It's easy to get great rewards every time you shop, review a product or refer a friend to Bright Star Kids.